Islam is a faith of beauty. 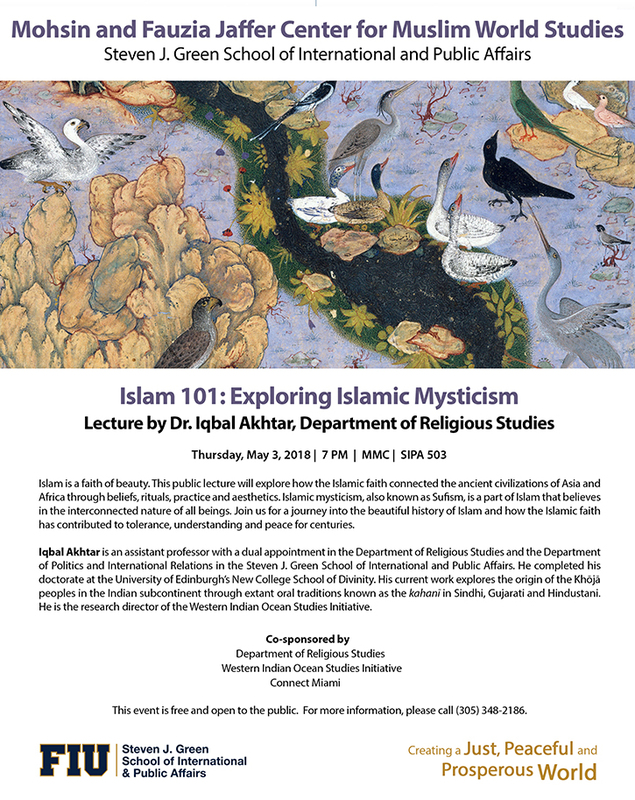 This public lecture will explore how the Islamic faith connected the ancient civilizations of Asia and Africa through beliefs, rituals, practice and aesthetics. Islamic mysticism, also known as Sufism, is a part of Islam that believes in the interconnected nature of all beings. Join us for a journey into the beautiful history of Islam and how the Islamic faith has contributed to tolerance, understanding and peace for centuries. Iqbal Akhtar is an assistant professor with a dual appointment in the Department of Religious Studies and the Department of Politics and International Relations in the Steven J. Green School of International and Public Affairs. He completed his doctorate at the University of Edinburgh’s New College School of Divinity. His current work explores the origin of the Khōjā peoples in the Indian subcontinent through extant oral traditions known as the kahanī in Sindhi, Gujarati and Hindustani. He is the research director of the Western Indian Ocean Studies Initiative. This event is free and open to the public. For more information, please call (305) 348-2186.